Have you been hearing the word probiotics mentioned a lot lately in the media? Or maybe you’ve seen “active cultures” printed on your yogurt containers? If not, you soon will, as Western culture is catching on to what the East, and particularly Japan, has known for years: probiotics — also known as good bacteria and friendly yeast — are essential to your digestive health. Probiotic supplements have become a multi-million dollar industry, opening the door for many companies that just want to get in on the game. This results in mediocre or even poor quality products flooding the market. If you’re as busy as the rest of us, you may not have time to ferment your own kefir or vegetables. While we encourage eating fermented foods whenever possible, taking Body Ecology’s handy Bifidus probiotic capsules, at home or on-the-go, is an easy way to get your daily dose of probiotics without missing a beat. There’s no doubt probiotics are getting a lot of attention as of late, and we’re here to help you figure out why. Ready to learn more? Body Ecology U courses are the perfect place to begin. Believe it or not, your digestive tract is loaded with bacteria and yeast, some of which promote good health and others that can compromise your health. The balance of the “good guys” and “bad guys” determine how healthy you are, how energized you feel, and how youthful you look. The good bacteria and yeast are called “probiotics,” literally meaning “for life.” There is some debate amongst experts on how to define these microscopic wonder bugs, but probiotics are widely described as organisms such as bacteria, viruses, and yeasts that support the strength and balance of the intestinal tract. You may also hear them referred to as "friendly" or "good" bacterium and yeasts. When ingested, probiotics work to keep illness and disease at bay. The most common bacteria strains that live in your gut are Lactobacillus and Bifidobacterium. Lactobacillus and Bifidobacterium are broken down into different species like Lactobacillus acidophilus (acidophilus) and Bifidobacterium bifidus (B. bifidus), which are broken down even further by different strains. There are also good yeasts, such as Saccharomyces cerevisiae and Saccharomyces boulardii, which help maintain your digestive health. Follow us on Facebook and become part of our growing Body Ecology community. Trust us, if you keep your good bacteria happy, you’ll see direct benefits to your inner ecosystem. For many people, this may mean improved health. For others, you may start to feel better, stronger, and more youthful. But what does science have to say about how probiotics benefit your gut and overall health? We’ll start by examining one of the most popular probiotic strains, Bifidus, with a growing body of research behind it. In order to sustain a healthy digestive system and not serve as a host for the bad guys, like Candida and parasites — feed your good bacteria and yeast what they need to stay alive. When the good guys thrive, you thrive. Healthy food and healthy habits are what the good bacteria and yeast crave. Eat a healthy Body Ecology Diet, full of whole, organic foods. Consume probiotic-rich fermented foods and drinks, like cultured vegetables and young coconut kefir. Follow a balanced Body Ecology lifestyle, with regular exercise and daily rest. Add FOS inulin as a prebiotic to your diet using EcoBloom. Supplement with additional probiotics for support. Probiotic supplements have become a multi-million dollar industry, opening the door for many companies that just want to get in on the game. This results in mediocre or even poor quality products flooding the market. Additionally, many companies fail to identify the strain or strains of bacteria in their products, making it impossible for consumers to check. When you're happy (and healthy), we're happy. Read our Body Ecology testimonials here. Before you take a new supplement, find out whether the bacteria have been clinically studied and proven effective. As you can see from the list above, our Body Ecology Bifidus Probiotic Capsules aren’t just convenient — they have a long list of studies to back them that only continues to grow. If you decide to take a probiotic supplement that contains Bifidobacteria, the good guys will have a far better chance of colonizing inside your gut when combined with probiotic foods. The probiotics in fermented foods are far more powerful than those in supplements, and they help create an environment where these more fragile bacteria can survive. Remember this: The definition of the word probiotic is “for life.” Coincidence? We think not. Or as comedian, actor, and film producer Steven Wright quipped, "Support bacteria — they're the only culture some people have." Looking for a good reason to start taking a daily probiotic capsule? We have at least 22 excellent reasons why a Bifidus probiotic could be the foundation of your gut and overall health. Aid in digestion and assimilation of food. Alleviate cold and flu-like symptoms. Contribute to a healthy pregnancy. 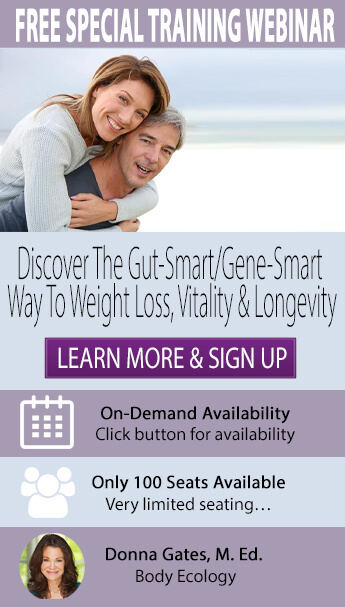 Help correct inflammatory bowel diseases, including Crohn’s and ulcerative colitis. Improve memory and reduce stress. May trigger an immune response against cancerous tumors. May work as an anti-inflammatory in cigarette smokers. Produce important vitamins, including biotin, B12, and K2. Protect against eczema in babies, when taken in the third trimester. Reduce markers of overall inflammation. Reduce markers of inflammation in those with celiac disease who are still eating gluten, as well as constipation, reflux, and indigestion. Reduce the effects of food allergies. Relieve constipation and diarrhea, even addressing constipation in children. Significantly improve symptoms of IBS, including bloating, gas, and abdominal pain. Taking a Bifidus probiotic capsule from a trusted source, with research to back it, could make a big difference in your gut health, overall wellness, and outlook on life. As we always say here at Body Ecology, a probiotic capsule is best paired with real, fermented foods at each meal to further inoculate the gut. We recommend adding cultured vegetables and young coconut kefir to your plate, as well as a prebiotic like EcoBloom to keep the “good guys” in your gut happy and well-fed. Eating the Body Ecology Diet also offers a well-rounded approach to support your best gut health yet. Chia, Lianne. “No miracle cure: Probiotics in treating autism.” Channel NewsAsia. Emiley A. Eloe-Fadrosh, Arthur Brady, Jonathan Crabtree, Elliott F. Drabek, Bing Ma, Anup Mahurkar, Jacques Ravel, Miriam Haverkamp, Anne-Maria Fiorino, Christine Botelho, Irina Andreyeva, Patricia L. Hibberd, Claire M. Fraser. Functional Dynamics of the Gut Microbiome in Elderly People during Probiotic Consumption. mBio, 2015; 6 (2): e00231-15 DOI: 10.1128/mBio.00231-15. Tabbers, M. M., et al. "Is Bifidobacterium breve effective in the treatment of childhood constipation? Results from a pilot study." Nutrition Journal1 (2011): 1. Childs, C. E., et al. "Bifidobacterium longum bv. infantis CCUG 52486 combined with gluco-oligosaccharide significantly reduces the duration of self-reported cold and flu-like symptoms among healthy older adults after seasonal influenza vaccination." Proceedings of the Nutrition SocietyOCE1 (2013): E10. Martinez, Fabio Andres Castillo, et al. "Bacteriocin production by Bifidobacterium spp. A review." Biotechnology Advances4 (2013): 482-488. Grimm, Verena, Christina Westermann, and Christian U. Riedel. "Bifidobacteria-host interactions—an update on colonisation factors." BioMed Research International 2014 (2014). Lau, Amy Sie-Yik, Jin-Zhong Xiao, and Min-Tze Liong. "Bifidobacterium for Infants: Essence and Efficacy." Beneficial Microorganisms in Medical and Health Applications. Springer International Publishing, 39-72. Allen AP, Hutch W, Borre YE, Kennedy PJ, Temko A, Boylan G, Murphy E, Cryan JF, Dinan TG, Clarke G. Bifidobacterium longum 1714 as a translational psychobiotic: modulation of stress, electrophysiology and neurocognition in healthy volunteers. Transl Psychiatry. 2016 Nov 1;6(11):e939. doi: 10.1038/tp.2016.191. PubMed PMID: 27801892. Ayelet Sivan, Leticia Corrales, Nathaniel Hubert, Jason B. Williams, Keston Aquino-Michaels, Zachary M. Earley, Franco W. Benyamin, Yuk Man Lei, Bana Jabri, Maria-Luisa Alegre, Eugene B. Chang, and Thomas F. Gajewski. Commensal Bifidobacterium promotes antitumor immunity and facilitates anti–PD-L1 efficacy. Science, November 2015 DOI: 10.1126/science.aac4255. Mortaz, Esmaeil, et al. "Anti-Inflammatory Effects of Lactobacillus Rahmnosus and Bifidobacterium Breve on Cigarette Smoke Activated Human Macrophages." PloS One 8 (2015): e0136455. Shin, Hea Soon, et al. "Hypocholesterolemic effect of sonication-killed Bifidobacterium longum isolated from healthy adult Koreans in high cholesterol fed rats." Archives of Pharmacal Research9 (2010): 1425-1431. Kim, Ji Yeun, et al. "Effect of probiotic mix (Bifidobacterium bifidum, Bifidobacterium lactis, Lactobacillus acidophilus) in the primary prevention of eczema: a double-blind, randomized, placebo-controlled trial." Pediatric Allergy and Immunology2p2 (2010): e386-e393. Bercik, P., et al. "The anxiolytic effect of Bifidobacterium longum NCC3001 involves vagal pathways for gut–brain communication." Neurogastroenterology & Motility12 (2011): 1132-1139. Spaiser, Samuel J., et al. "Lactobacillus gasseri KS-13, Bifidobacterium bifidum G9-1, and Bifidobacterium longum MM-2 Ingestion Induces a Less Inflammatory Cytokine Profile and a Potentially Beneficial Shift in Gut Microbiota in Older Adults: A Randomized, Double-Blind, Placebo-Controlled, Crossover Study." Journal of the American College of Nutrition 6 (2015): 459-469. Smecuol, Edgardo, et al. "Exploratory, randomized, double-blind, placebo-controlled study on the effects of Bifidobacterium infantis natren life start strain super strain in active celiac disease." Journal of Clinical Gastroenterology2 (2013): 139-147. Mendonca FH, Santos SS, Faria Ida S, et al. Effects of probiotic bacteria on Candida presence and IgA anti-Candida in the oral cavity of elderly. Braz Dent J. 2012;23(5):534-8. Jung-Hwan Kim, Eun-Ji Jeun, Chun-Pyo Hong, Seong-Hoon Kim, Min Seong Jang, Eun-Jung Lee, Sook Jin Moon, Chang Ho Yun, Sin-Hyeog Im, Seok-Geun Jeong, Beom-Young Park, Kyong-Tai Kim, Ju-Young Seoh, Yoon-Keun Kim, Sung-Jong Oh, Jun-Sang Ham, Bo-Gie Yang, Myoung Ho Jang. Extracellular vesicle–derived protein from Bifidobacterium longum alleviates food allergy through mast cell suppression. Journal of Allergy and Clinical Immunology, 2016; 137 (2): 507 DOI: 10.1016/j.jaci.2015.08.016. Kondo, Shizuki, et al. "Antiobesity effects of Bifidobacterium breve strain B-3 supplementation in a mouse model with high-fat diet-induced obesity." Bioscience, Biotechnology, and Biochemistry 8 (2010): 1656-1661. Guglielmetti, Simone, et al. "Randomised clinical trial: Bifidobacterium bifidum MIMBb75 significantly alleviates irritable bowel syndrome and improves quality of life––a double-blind, placebo-controlled study." Alimentary Pharmacology & Therapeutics10 (2011): 1123-1132.